" I am ever present to those who have realized me in every creature. Seeing all life as my manifestation, they are never separated from me. They worship me in the hearts of all, and all their actions proceed from me. Wherever they live, they abide in me"
Life, as I see it is a journey...a journey through rough and rugged terrain. A place where we come to learn and refine our souls. We have lessons to learn and obstacles to overcome. It has been my constant companion, the desire to grow, learn and become better than I was. As the late Eknath Easwaran put it, "...to emerge from this life victorious". What makes us victorious in this life? Well, I will share my opinion--When we remember to be compassionate not only to others but to ourselves. When we remember to love others as ourself and remember to love ourselves. When we seek to learn from every turn, every meeting and every "mistake". When finally learn to have peace within ourselves knowing that we encounter in our lives nothing which we we can not overcome. When we acknowledge our responsibility for our lives and our choices. And in the end when we truly learn what we are to focus on ... that which is love, compassion, and true peace. When we have those in the scope of our lives.. those who cross our paths that can not focus on their own growth, their own lessons but choose instead to focus on the splinter in your eye while ignoring the beam in their's. This metaphor I borrow from Jesus of Nazareth--we should look upon them with love, compassion and peace and not judge them. We realize that they also on a journey but their level of self realization should have no bearing on our own. We pray for them to have greater understanding and growth as we pray for ourselves. To emerge from this life Victorious....knowing that you are have grown fully into YOU shining forth your own spark of the Divine. 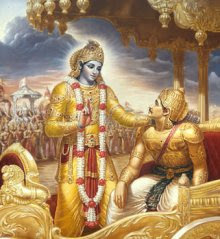 Sri Krishna in the Bhagavad Gita (God's Song) tells Arjuna that there are two paths. Be fearless and pure; never waver in your determination or your dedication to the spiritual life. Give freely. Be self-controlled, sincere, truthful,loving, and full of the desire to serve. Realize the truth of the scriptures; learn to be detached and to take joy in renunciation. Do not get angry or harm any living creature, but be compassionate and gentle; show good will to all. Cultivate vigor, patience, will, purity; avoid malice and pride. Then, Arjuna, you will achieve your divine destiny. It is never too late to choose the right path as long as breath is in you. Choosing the right path is emerging from life victorious. Choose each day to be victorious in your life.